In 2012 a mere 13 parking meters were painted red by the Homeless Outreach Services Team and installed throughout Salt Lake City giving residents a place to donate small change to homeless services providers instead of giving it directly to panhandlers to feed their addictions.--- Since 2012 those meters have through matching grants helped raise $40,000 for homeless service providers. Now the HOST team is issuing a call of action in a new effort to get hundreds more meters installed not only in the city but throughout the county. 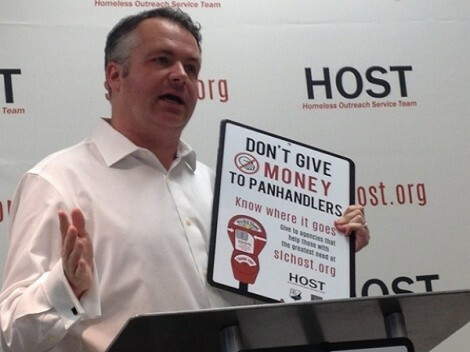 At a press conference Downtown Alliance Director Jason Mathis (pictured) announced that the HOST program was making a new push for donations to help the homeless and discourage money being given to panhandlers. Mathis said that while people giving money to panhandlers may have the best intentions their money may lead to the worst results when it comes to funding the drug addictions of the homeless. The HOST program is a collaboration between the Salt Lake City Police Department, the Downtown Alliance and numerous agencies providing housing, medical and other support to the local homeless population. Mathis announced that the HOST website was relaunched at SLCHost.org to help people understand how to help service providers. 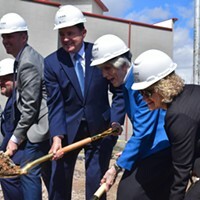 He also explained that since Salt Lake City replaced its old parking meters with new electronic ones, that there were as many as 2,000 parking meters that could be painted and distributed throughout the city to collect change to help service providers. Mathis explained that they are now looking for businesses that would sponsor the new meters and have them in front of their establishments. Salt Lake City Police Chief Chris Burbank explained that the homeless problem is compounded by factors ranging from criminal gangs using the homeless to sell drugs to the fact that many drug users contributing to the culture of addiction near the shelter aren't even from Salt Lake City. “They come down there because they don't want to be seen in their own neighborhood purchasing narcotics,” Burbank said. While Burbank's officers keep busy with policing the criminal element, he says the issue is larger than anything his officers can handle.